Before your big day, you’ll often hear your friends and relatives say “your wedding is going to fly by.” This is no different for destination weddings, even though the festivities last longer. 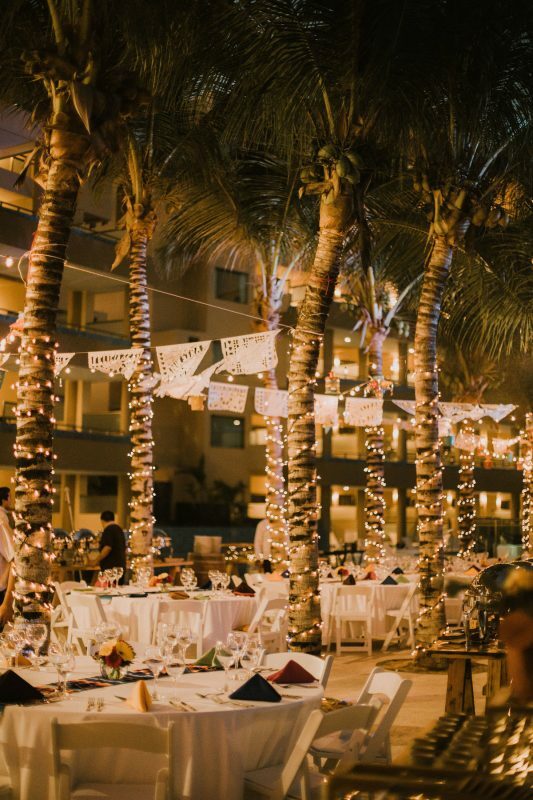 Among all the planning and commotion of those days leading up to the ceremony, brides and grooms can miss out on the best parts about being in a vacation destination. There is so much you can do to get the most out of being in such a beautiful location. These are our tips on how to maximize relaxation, luxury, and fun while traveling for your destination wedding. Not everyone has the luxury of being near an airport that flies direct to a destination, but if you do, take advantage of it. Lugging bags (and probably your wedding gown) from gate to gate is hectic, and you should be as relaxed as possible during this time. If you’re near a city where we operate charter flights, that’s even better. You can lock in charter seats at a discounted rate for you and your guests and the flights are always non-stop. 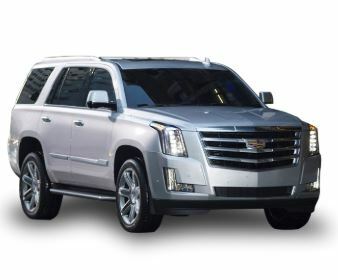 If you’re a bride or groom heading to your destination wedding, you should ride in style as the VIPs you are. Deluxe transfers taking you to and from the airport are roomy, comfortable, and luxurious – just what two people about to get married should have after a day of travel. This is uber important. Most resorts will ask that you arrive at least two days before the wedding, but it’s definitely not a bad idea to arrive even earlier. 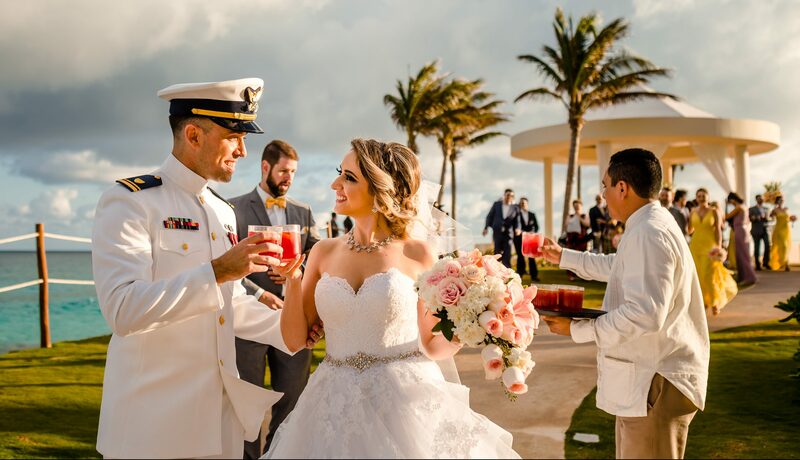 It will give you time to meet with the resort wedding coordinator to finalize details, tour the property, and get a chance to see the venues. Plus you’ll be there before many, if not all, of your guests. Allow yourselves time to enjoy being together before it becomes all about friends and family. Indulging in some spa treatments is practically a must for two people who have spent the last months stressing about a wedding. I would definitely suggest booking them for one of the first days you arrive. That way by the time your guests get there, you’ll be completely rejuvenated. It’s your wedding – live it up! You deserve to have amazing accommodations. If the price is an issue for a full stay, no worries! There are other options. For one, there are many resorts that include an upgraded room as part of their package. 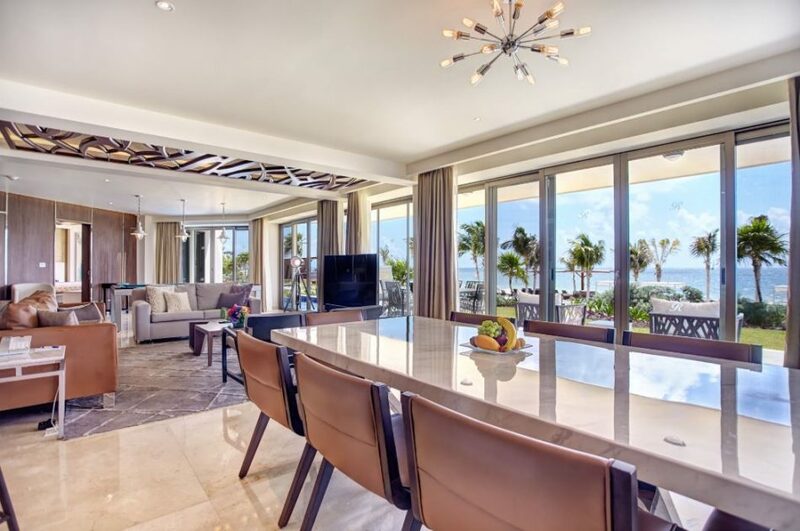 Our team knows the resorts that offer room upgrades, so don’t hesitate to let us know it’s a priority when planning. You can also book what we call a “split stay.” With a split stay, you could stay some nights in a regular room and spend the other nights in an upgraded room. This gives you a taste of elevated luxury without breaking the bank. Some of our brides and grooms book the Presidential Suite just for the wedding night plus a couple nights following. Best perks to this arrangement? 1) The room is for sure guaranteed, and 2) a larger room is absolutely perfect for a wedding party to get ready in, saving you money on booking the bridal suite. Whether before the wedding or after, do something fun that’s not related to the big day. 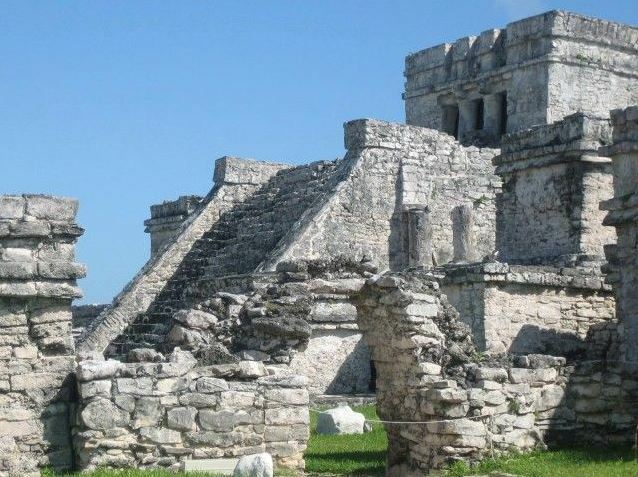 See ancient ruins, go snorkeling, shop in the local towns. This can be a romantic excursion for just the two of you or you can make it a group outing with your wedding guests. It’s a great way to take your mind off of things and just have a blast. At Weddings by Funjet we offer the Come Away with Me package where you can have your Concierge travel with you. They are with you every step of the way, arriving before the wedding to assist you with all the last minute details. Their assistance comes with abundant experience and knowledge on how to make everything run smoothly. Check out the weddings of Erin and Matt and Laura and Jason, both of which our girl Ashley traveled with and helped make amazing! Welcome parties are an awesome way to show gratitude to your guests. Not only that, but they can also take a lot of stress off of you. Rather than having to take time out of your week to greet your guests one-by-one, you can welcome them all in one fell swoop. Opt to have the party the night before the wedding. Most of your guests will have arrived by then, so you won’t be leaving anyone out. They can also fit any budget. Some couples choose to have a small wine cellar dinner with just immediate family, while others might go a bit extra and add a DJ, dance floor, cigar roller, etc. One of my favorites is the beach bonfire party – especially if there are s’mores! Cool part is you get to use a different venue than your wedding and can dabble with playful décor. Trust me. You will want at least a couple days of decompressing after the wedding. It will be a whirlwind, and you may find yourself enjoying less of the resort than you had thought. Even just an extra day to pack is incredibly helpful! At the end of the day, just remember you’re also on vacation! Take time out for what you want to do. It’s the biggest week of your life – slow down and enjoy it!